I started gaining weight since I got married. Sometimes I don't feel like looking at the mirror because it makes me see the reality of me getting fat and bigger. Whew! Most of my clothes and pants doesn't fit anymore and I'm even having a hard time choosing what to wear every time I go out. Losing weight has been a struggle and a challenge. Before, I use to exercise everyday or at least 4 times a week at night before I go to bed. I don't eat dinner and sometimes I go jogging with my sister on weekends but now it has been so hard for me to do it again. I've been very lazy to play the CD which I use to watch and follow whenever I exercise. I eat a lot! Actually, I love eating that's why even if I'm not hungry I still eat whenever someone invites me to hahahaha!!! I have planned to go on a diet for many times but each time I decide to do it that's when I'm craving more. It's true when they say that it's easy to gain weight than to loose. Last Saturday my sis and I went on a food tripping. 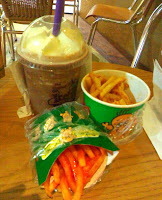 We ate mango vanilla cream crepe, bought fries and went to Coffee Bean for a rich Ice Blended Mocha. Isn't it great to satisfy your cravings? But then I've promised myself that it will be the last. They say health is wealth and being fat is not always healthy. This time, I'll be sincere. Doing so is not easy and fast. I know I have to be patient and focused. I've done it before that's why I can do it again. with the wrong mental attitude"
"You just can't beat the person who never gives up"
I'd like to hear your stories too. Do you have the same weight problem? Any motivations that you could share?